In this post, I wanted to add a bit more about her writing. The best I can tell, Mrs. Steele published three books, two non-fiction and one fiction. Also, she wrote poetry that was recited on some occasions at events in Northwest Arkansas. Her poetry was mentioned by Fred Starr in one of his columns. I have not found any of poetry that she published. 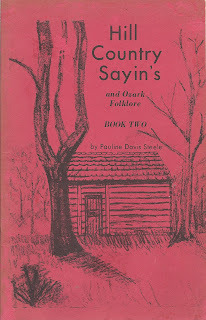 Hill Country Sayin's and Ozark Folklore, Book 2, self-published, 1977. The book includes several recipes (e.g. vinegar pie), folk beliefs and folklore (for example, when to take a bath), and brief stories about her brothers, parents, and her life growing up in West Folk. Though parts of these two books do not tell readers anything they don't already know, the other parts are juicy bits of information about life in the Ozarks. 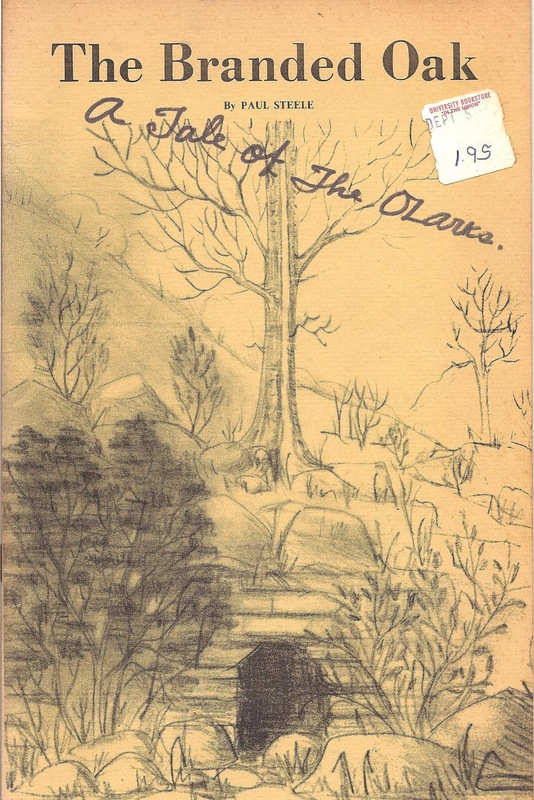 Mrs. Steele's fiction book is titled The Branded Oak: A Tale of the Ozarks. The cover states that the author is "Paul Steele." The book was published by the Hutcheson Press (in West Fork, Arkansas). No publication date is given, but it probably was published in the early 1970s. 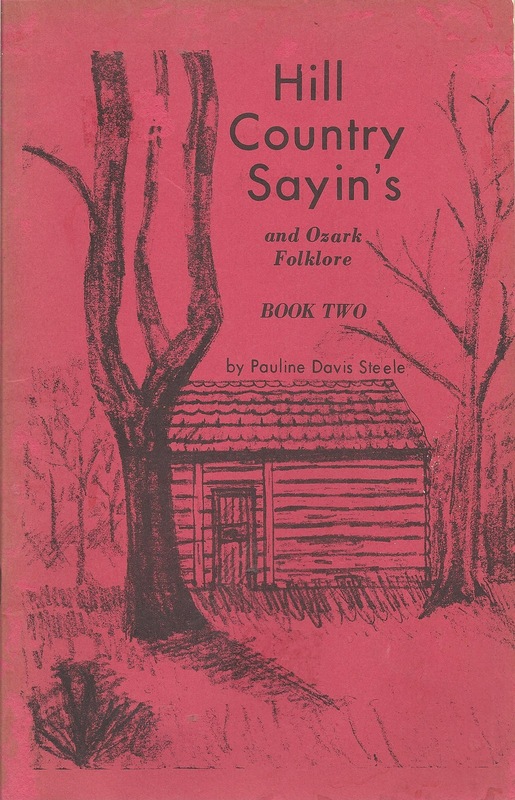 Pauline Steele (Branded Oak author "Paul Steele"), native born Ozarkian and proud of it, received her education at the University of Arkansas. She is a B.S.E. English major, has an M.S. Childhood Development, has done graduate work in counseling, and is a former counselor in Woodland Junior High School, Fayetteville, Ark. She is a member of Delta Kappa Gamma Society. Pauline has followed two successful careers simultaneously, being an ordained minister and public school teacher. Her work is the religious field has complimented [sic] her understanding of the teaching field. She like children, books, dogs, and people talking. Being the only girl in a family of five children and as the youngest, she has soaked up her surroundings and has always had an ardent wish to write about them. May that inward current of creativity that has dogged her tracks through her busy life have time to express itself in more studies like The Branded Oak. This small book, about 24 pages in pamphlet form, has a nicely illustrated cover. I purchased it from the University of Arkansas bookstore sometime in the late 1970s, I believe. I can find no other copies for sale. It is in special collections of the University of Arkansas library. 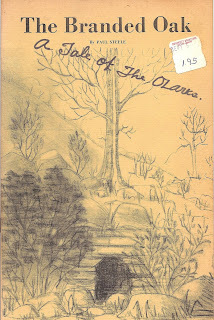 The story centers on the interest of two young boys -- probably about twelve years old -- who think something is fishy about two women who bought "the Old Hughes Place" -- rumored to be haunted -- near their farms. The two boys -- Chip and his best friend Kenneth Kee -- live on farms near each other, just a short distance from Beaver Lake. They observe some strange things about the behavior of these two weird-acting women, Sadie and Sally. Among other things, these women do not want to join in community activities and they don't go to the local church. Also, they spend too much of their time on a boat on Beaver Lake. In addition, they walk and act funny. The uplifting story includes a fun loving grandpa, understanding parents, and a school that Chip enjoys. In the end, despite the fact that the grownups don't seem too concerned about Sadie and Sally, Chip and Kenneth end up -- at their peril -- proving they were right to be suspicious of them. Perhaps giving away some of the plot, I will say that some drug running on Beaver Lake was involved, as was some cross dressing. One element of the plot involves the University of Arkansas playing the University of Georgia in the Sugar Bowl, which occurred in 1969. So, the story must have been written sometime after the end of 1969, when the game took place. The story was clearly written for an early teenage audience by a person who had been both a school teacher and minister. It is a quick, fun visit to an upbeat world in the Ozarks. As with her work as an educator and minister, we have to admire the warmth, intelligence, and kindness that can be found in her books and to appreciate her accomplishments. Thank you for your note. 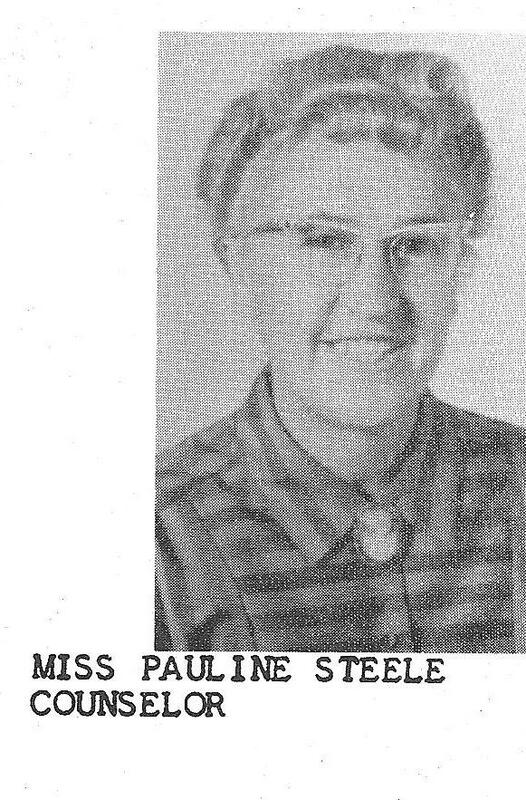 I knew Mrs. Steele mainly as a 5th grade teacher. And I thought she was the greatest. I did not know much about her other calling, as a minister. I'm sure that she made a strong impression on many people who knew her in her roles as minister and evangelist. It is good to hear from someone who had such a close relationship with her and whom she (and her close colleague, Mary Ruth Branham) influenced so positively. Mrs. Steele did much good in her life. Mrs. Steele went to Woodland as counselor the first year it was open. That was the year we started to Hillcrest. Many years before that she taught my brothers in Lincoln, Arkansas. She was still Pauline Davis at the time. I have a picture of her with her class and my oldest brother is in it. Her brother, Paul, was Washington County Clerk for a period of time. His daughter, Sue Davis lived in the Jefferson school district at least part of the time when she was young. Let's face it, we didn't do a whole lot of work that year. She was easy to talk into long recess. And she never seemed to notice how early I left to go work in the office. She was easy going. About another favorite teacher, Vivian Schurfranz went from Hillcrest to FHS to teach one year. Check your 1963 Amethyst (the white one), page 21. I took world history as a sophomore just so I could have her as teacher. Thanks for your comments, and I apologize for the long delay in responding. Yes, Mrs. Steele was easy going and I liked her very much. I spent much time after school cleaning her blackboard erasers and doing other errands for her. Once she sent me up to the Square with some coins to buy a birthday card for her to give to her sister. Thanks for the information about Mr. Trahin. We were sorta buddies when I was in the 3rd grade, but I lost track of him after that. Mrs. Schurfranz quit full-time teaching at some point and worked on her history masters degree at the Univ. of Arkansas. The first class I took at UA in Summer 1965 was an International History course that she taught. She was another favorite of mine, too. Oops. Mrs. Steele didn't have a sister, so my statement above that she sent me to buy a birthday card for her sister is wrong. As I recall, it was a birthday card for close friend. Thank you for the warm and vivid memories of Mrs. Steele. I knew her as a kind and encouraging 5th grade teacher who made a big impression on me. It is great to hear from others who remember her through her ministry. We all recall that she had a big smile and hearty laugh.